Man and nature living in harmony without economic pressures. How can industrial nations reframe their society with the help of indigenous communities? “Sumak Kawsay”, also known as “Buen Vivir”, is a worldview the indigenous people of the Andes share. It has gained international traction in the past years because some Latin American politicians want industrial nations to adopt central aspects of this lifestyle. “Buen Vivir” doesn’t only seek a harmonious life with nature. More concretely, it also entails new “development ethics”, namely showing solidarity in a society which is no longer obsessed with economic growth. The economist and former energy minister of Ecuador Alberto Acosta set himself the goal to popularise this way of thinking on an international level. As president of the constituent assembly, he was a significant force behind the implementation of the “Buen Vivir”-principles in the Ecuadorian constitution. Shortly after, Bolivia followed this example. Alberto Acosta is co-founder of the well-known Yasuní-ITT Initiative. In a deal with the international community, Ecuador offered to give up the extraction of oil in the Yasuní National Park in return for financial compensation. The initiative to protect the climate, rainforests, and several indigenous people is part of an international discussion. 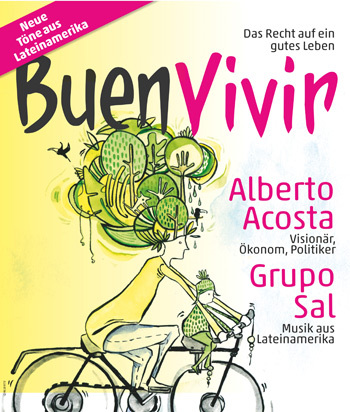 To encourage the discussion about “Buen Vivir” in the German-speaking regions, too, Grupo Sal presents an informative but also artistic programme together with Alberto Acosta which deals with a life in unity. How does “Buen Vivir” work? What kind of views does it entail? Is it possible to export this indigenous concept to our world? Can the oil only stay in the ground in our most beautiful dreams? Alberto Acosta puts forth his ideas on this topic and talks about his experience with the political implementation of this concept. A dialogue with the journalist Thomas Pampuch adds to the discussion in which the audience is encouraged to partake in.